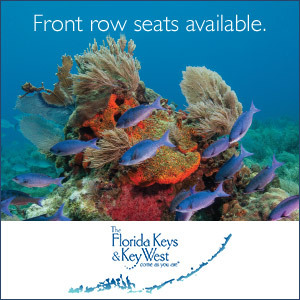 Enjoy pristine reefs, undersea arches, abundant fish and playful pinnipeds, all within 14 miles of the mainland. Shimmering beams of light penetrate the kelp canopy at Cathedral Cove as my buddy, Emily, and I hover above a lush rock reef. In the cool 64°F water, the underwater terrain is covered with a mix of algae, eelgrass, brown and red gorgonians and hydrocoral. Soon we are joined by a playful harbor seal, intent on entertaining us with a display of acrobatics. The seal nibbles our fins and circles us twice before slowly coming belly to belly, then face to face and finally nose to nose with Emily. As the seal's whiskers tickle her cheeks, Emily squeals with nervous delight, expelling a blast of bubbles from her regulator. Like a mischievous puppy, the seal starts to pry off her mask. Emily squirms with another explosion of bubbles, the seal lets go, spins nonchalantly and zips away, only to return moments later with two friends. Playful harbor seals and kelp cathedrals are just two of the many reasons divers in southern California frequent Anacapa Island, the closest of the Channel Islands, located just 14 miles off the coast and barely an hour's ride on a fast boat. Situated on the leeward side of neighboring Santa Cruz Island, Anacapa often delivers calm, clear water when conditions are rougher elsewhere. Composed of three mini-islets (West, Middle and East Anacapa), the island is barely a half-mile wide and five miles in length. It is home to at least 30 named dive sites, which run the gamut from kelp beds and rock reefs to underwater caves and arches. It offers a mix of pristine no-take reserves populated by abundant and relatively fearless marine life, and unprotected zones that allow lobster and spearfishing (in season). In short: The island has something for every diver. It even boasts a few well-worn wrecks, the 1835 steamship Winfield Scott most notable among them. Sightings of angel sharks, bat rays, moray eels, sea lions and harbor seals are not uncommon. Anacapa's rock formations are as dramatic above the surface as below. Narrow passageways between each islet are strewn with towering pinnacles. On the island's east end stands iconic Arch Rock and a handsome lighthouse that seems plucked out of Nova Scotia. Once anchored at Goldfish Reef off the front side of West Anacapa, Emily and I stride into clear blue-green water and descend to a collection of rock reefs (average depth is 30 to 50 feet); they are decorated with unblemished golden, purple and red gorgonian sea fans. Garibaldi, the official marine fish of California, sizeable sheephead and schools of señorita wrasses cruise above the reef, while red and purple sea urchins, sea stars and scallops cling to the rocks. Spiny lobsters peer out from the crags and crevices. brilliant purple and orange Spanish shawl nudibranchs. For our third and last dive of the day, we head to the backside of Anacapa to dive Underwater Arch, part of a patchwork of reefs separated by channels of sand. I spot sea lions on the shore and hope Emily and I will get another pinniped visit. We drop in and work our way west toward the arch. The surge is nonexistent, so we settle on the sandy bottom and watch as perch, kelp bass and sheephead check us out as they explore the rocky archway. We glide leisurely around the surrounding finger reefs and take in the wonderful mix of macro life, kelp, invertebrates and fish. When we surface, warm brownies await on deck, with the pristine island as our backdrop. Within an hour, we are back in bustling Ventura Harbor with all the comforts southern California has to offer. Anacapa Island is part of the Channel Islands National Park with 30 named dive sites and depths ranging from 20 to 130 feet. The easiest way to dive Anacapa is to book with one of the professional dive boats out of Ventura or Santa Barbara. Conditions: People dive Anacapa year-round. Southern California water temperatures average between 55°F and 68°F, with winter in the 50s°F and summer and fall in the 60s°F. Air temperatures run from 60°F to 75°F in the summer and can fall to the 50s°F in the winter and spring. Water visibility averages between 30 feet and 60 feet and tends to be best in October and November. A 6mm to 8mm wetsuit, hood and gloves or a drysuit are recommended year-round. Getting There: Dive boats leave daily from Ventura Harbor and occasionally from Santa Barbara. Reservations are strongly recommended. The closest major airports are Los Angeles (LAX) or Santa Barbara (SBA). From LAX: Take the I-405 Freeway north to the I-101 Freeway north to Ventura and exit at Victoria Avenue. Turn left on Victoria, and go about 1 mile to Olivas Park Drive. Turn right on Olivas, and follow about 4 miles to Ventura Harbor. (Note: At the harbor, Olivas becomes Spinnaker Drive.) From SBA: Follow the I-101 Freeway south to Ventura. Exit at Seaward Avenue, then turn left on Harbor Boulevard. Follow Harbor south for 2 miles, then turn right on Spinnaker. Follow signs to "Harbor" to locate dive boats in Ventura Harbor Village, a complex of restaurants and shops on Spinnaker Drive in Ventura Harbor. Dive Operators: Ventura Dive & Sport runs the Raptor, a fast 46-foot dive boat that heads to Anacapa almost daily; tanks and food included. Contact 805-650-6500. The Peace dive boat offers nitrox fills and a hot tub on deck. Contact 805-650-3483. California Boat Diving offers a range of day and overnight trips on the Spectre and Explorer dive boats. Contact 1-866-CAL-DIVE, 805-486-4486. The Truth Aquatics fleet out of Santa Barbara's harbor makes occasional trips to Anacapa; call or check its calendar. Contact 805-962-1127.